All of flowers used in our bouquets that are created by the Balmedie Florists have been directly imported to us from our cultivators in Holland, a region of the Netherlands renowned for its flowers. This ensures that our flowers are of the highest standard and with up to four deliveries per week, not only are our flowers of premium standard but they are also the freshest with a high longevity. This means that the flowers in our bouquets are long-lasting so your recipient will be able to enjoy their bouquet for many days to come. 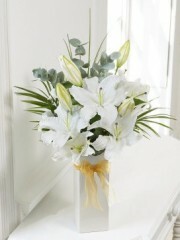 Our Balmedie Florists can expertly arrange all sorts of bouquets, such as hand-ties, perfect for any and all occasions. Our Balmedie Florists intricately weave together a mixture of flowers which are range in shape, size and colour which are then surrounded by lush greenery such as eucalyptus leaves. The Balmedie Florists make sure that all the bouquets are perfectly rounded and have a full body before wrapping them up in gorgeous papers, tissues and ribbons or they can also place your flowers into a lovely vase or box depending on what it is you're look for. If you don't find what you're looking for and already have something in mind then don't worry as we offer our customers the bespoke service. Through our bespoke service, our customers are able to work with our Balmedie Florists to create the perfect bouquet for your recipient. You can tell us what flowers to use, what flowers not to use, any colour preferences so when it comes to giving your recipient their bouquet, they are bound to love it as it has been tailored to their tastes. Our Balmedie Florists are professionals when it comes to floristry with over forty years of experience so we can modestly say that they have and will continue to provide you with the best service out there. 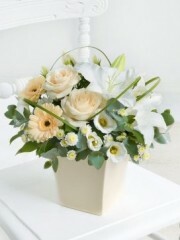 Once your order has been placed and organised by our Balmedie Florists, we offer our customers several delivery services to choose from if you so wish it. We offer our customers our standard delivery service which runs weekly every Monday to Saturday, our next day delivery service as well as our same day delivery service. The same day delivery service allows our customers to place an order and have it delivered on the same day which means our Balmedie Florists arrange your flowers on the day. In order to use this service, your order must be placed before 3PM to give our Balmedie Florists enough time to get everything organised for you. Unfortunately, when it comes to our deliveries, we are unable to make promises when it comes to specific times as we are unable to control traffic or the weather but we do have our AM and PM deliveries. This means we are able to deliver before 1:30PM and then after 1:30PM but asides from those two time frames, we can't guarantee times. We want our customers to know that once your order has been placed, our Balmedie Florists will take care of everything for you so you don't need to worry abut a single thing and are able to focus on your loved ones.